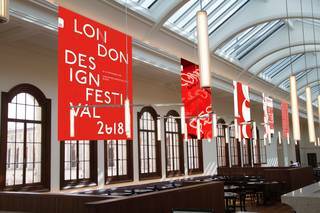 Celebrating ten years with the V&A as the official London Design Festival hub, Pentagram will transform the space with the graphic identities created over the decade. With a characteristic V&A mix of heritage, modernity and design ingenuity, the Members’ Room, designed by architects Carmody Groarke, transforms a magnificent top-lit gallery on the top floor of Aston Webb’s Grade 1 listed 1909 wing into a beautiful dedicated space for Members, offering a different perspective at the heart of the Museum. The Members’ Room opened in October 2017, so this year will be its first London Design Festival. The Members’ Room will be open for use by Festival visitors on Thursday 20 September. Visitors are invited to experience a taste of Membership, while enjoying striking views of the Sackler Courtyard and Henry Cole building.